Where do TDS and Salinity Come From? Salts dissolve in water to produce an anion and a cation. 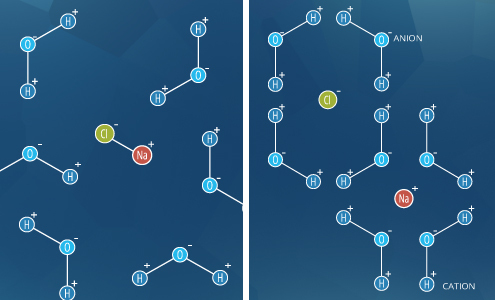 These ions make up the basis of conductivity in water. Conductivity is a measure of water’s capability to pass electrical flow. This ability is directly related to the concentration of ions in the water 1. These conductive ions come from dissolved salts and inorganic materials such as alkalis, chlorides, sulfides and carbonate compounds 3. Compounds that dissolve into ions are also known as electrolytes 40. The more ions that are present, the higher the conductivity of water. Likewise, the fewer ions that are in the water, the less conductive it is. Distilled or deionized water can act as an insulator due to its very low (if not negligible) conductivity value 2. Sea water, on the other hand, has a very high conductivity. Ions conduct electricity due to their positive and negative charges 1. When electrolytes dissolve in water, they split into positively charged (cation) and negatively charged (anion) particles. As the dissolved substances split in water, the concentrations of each positive and negative charge remain equal. This means that even though the conductivity of water increases with added ions, it remains electrically neutral 2. Conductivity is usually measured in micro- or millisiemens per centimeter (uS/cm or mS/cm). It can also be reported in micromhos or millimhos/centimeter (umhos/cm or mmhos/cm), though these units are less common. One siemen is equal to one mho 1. Microsiemens per centimeter is the standard unit for freshwater measurements. Reports on seawater conductivity use micro-, milli- and and sometimes even just siemen/mho per centimeter, depending on the publication. Specific conductance at 25 degrees C is used as a standard of comparison for different water sources as conductivity ratios change with temperature. Specific conductance is a conductivity measurement made at or corrected to 25° C 3. This is the standardized method of reporting conductivity. As the temperature of water will affect conductivity readings, reporting conductivity at 25° C allows data to be easily compared 3. Specific conductance is usually reported in uS/cm at 25° C 6. If a conductivity measurement is made at 25° C, it can simply be reported as the specific conductance. If a measurement is made at a different temperature and corrected to 25° C, then the temperature coefficient must be considered. The specific conductance temperature coefficient can range depending on the measured temperature and ionic composition of the water 32. A coefficient of 0.0191-0.02 is commonly used based on KCl standards 3,32. NaCl-based solutions should have a temperature coefficient of 0.02-0.0214 33. Conductivity is formally defined as the reciprocal of resistivity, which is worth elaborating on 3. Resistivity is a measurement of water’s opposition to the flow of a current over distance. Pure water has a resistance of 18.2 Mohm*cm 5. 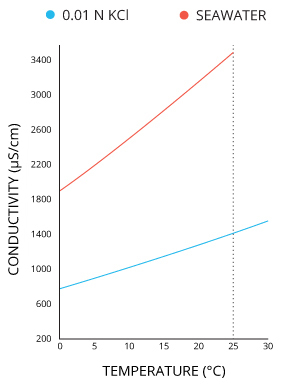 Resistivity decreases as the ionic concentration in water increases. 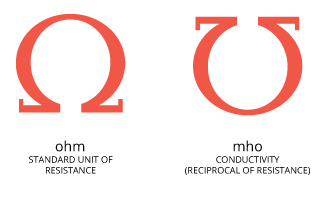 A fun way to remember that resistivity and conductivity are reciprocals (1/measurement) is in the unit name – mho and ohm are the same letters, in reverse. Conductance is part of conductivity, but it is not a specific measurement on its own. Electrical conductance is dependent on the length of the conductor, just as resistance is 18. Conductance is measured in mhos or siemens 19. Conductivity is the conductance (S) measured across a specified distance (1 cm), which is incorporated into the units (S/cm) 19. As such, the conductance of water will change with the distance specified. But as long as the temperature and composition remains the same, the conductivity of water will not change. Salinity is an ambiguous term. As a basic definition, salinity is the total concentration of all dissolved salts in water 4. These electrolytes form ionic particles as they dissolve, each with a positive and negative charge. As such, salinity is a strong contributor to conductivity. While salinity can be measured by a complete chemical analysis, this method is difficult and time consuming 13. Seawater cannot simply be evaporated to a dry salt mass measurement as chlorides are lost during the process 26. The most common ions in sea water. More often, salinity is not measured directly, but is instead derived from the conductivity measurement 6. This is known as practical salinity. These derivations compare the specific conductance of the sample to a salinity standard such as seawater 6. Salinity measurements based on conductivity values are unitless, but are often followed by the notation of practical salinity units (psu) 25. There are many different dissolved salts that contribute to the salinity of water. The major ions in seawater (with a practical salinity of 35) are: chloride, sodium, magnesium, sulfate, calcium, potassium, bicarbonate and bromine 25. Many of these ions are also present in freshwater sources, but in much smaller amounts 4. The ionic compositions of inland water sources are dependent on the surrounding environment. Most lakes and rivers have alkali and alkaline earth metal salts, with calcium, magnesium, sodium, carbonates and chlorides making up a high percentage of the ionic composition 4. Freshwater usually has a higher bicarbonate ratio while seawater has greater sodium and chloride concentrations 39. The Gibbs function is the basis of calculating absolute salinity. It considers the entire system as a whole instead of relying solely on conductivity. While the Practical Salinity Scale is acceptable in most situations, a new method of salinity measurement was adopted in 2010. This method, called TEOS-10, determines absolute salinity as opposed to the practical salinity derived from conductivity. Absolute salinity provides an accurate and consistent representation of the thermodynamic state of the system 24. 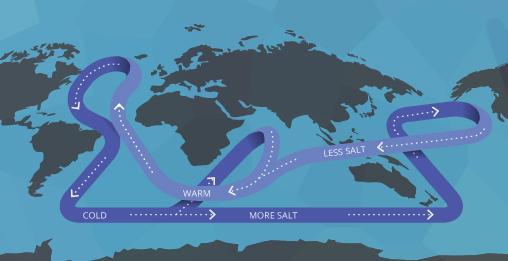 Absolute salinity is both more accurate and more precise than practical salinity and can be used to estimate salinity not only across the ocean, but at greater depths and temperature ranges 24. TEOS-10 is derived from a Gibbs function, which requires more complex calculations, but offers more useful information 24. The units used to measure salinity fluctuate based on application and reporting procedure. Parts per thousand or grams/kilogram (1 ppt = 1 g/kg) used to be the standard 22. In some freshwater sources, this is reported in mg/L 4, 37. Now salinity values are reported based on the unitless Practical Salinity Scale (sometimes denoted in practical salinity units as psu) 22. As of 2010, an Absolute Salinity calculation was developed, but is not used for database archives 24. Absolute salinity is reported in g/kg and is denoted by the symbol SA. TEOS-10 offers pre-programmed equations to calculate absolute salinity. The different methods and units of salinity measurements all rely on a reference point of 35 for seawater. The units psu, ppt and SA g/kg are nearly equivalent (and often interchanged) 6. All three methods are based on an approximate salinity value of 35 in seawater 24. However, there are some distinctions that must be made. Practical salinity units are dimensionless and are based on conductivity studies of potassium chloride solutions and seawater 13. These studies were done with 32.4356 g/kg KCL solution and “Copenhagen water” which has a chlorinity of 19.374 ppt 25. This north Atlantic sea water was given a set practical salinity of 35 psu 25. The practical salinity scale is considered accurate for values between 2 and 42 psu 26. 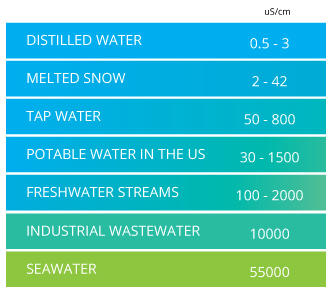 These are the most common units used, and practical salinity remains the most common salinity value stored for data archives 24. Determining total salinity based on chloride concentrations in only accurate in water sources with a known chloride-salinity ratio, such as seawater. This method is only acceptable for seawater, as it is limited in estuaries, brackish and freshwater sources 28. While salinity and chlorinity are proportional in seawater, equations based on this are not accurate in freshwater or when chlorinity ratios change 26. Absolute salinity in g/kg is best for studies that require very precise data. It is consistent with other SI units as a true mass fraction, and it ensures that all thermodynamic relationships (density, sound, speed and heat capacity) remain consistent 24. These units also help determine specific ions’ contributions to salinity values 39. Absolute salinity also offers a greater range and more accurate values than other salinity methods when ionic composition is known 24. The EPA, USPHS and AWWA recommend an upper limit of 500 mg/L TDS, though this is exceeded in some regions with little ill effect 41. Total dissolved solids (TDS) combine the sum of all ion particles that are smaller than 2 microns (0.0002 cm) 11. This includes all of the disassociated electrolytes that make up salinity concentrations, as well as other compounds such as dissolved organic matter. In “clean” water, TDS is approximately equal to salinity 12. In wastewater or polluted areas, TDS can include organic solutes (such as hydrocarbons and urea) in addition to the salt ions 12. Total dissolved solids concentrations outside of a normal range can cause a cell to swell or shrink. This can negatively impact aquatic life that cannot compensate for the change in water retention. While TDS measurements are derived from conductivity, some states, regions and agencies often set a TDS maximum instead of a conductivity limit for water quality 37. At most, freshwater can have 2000 mg/L of total dissolved solids, and most sources should have much less than that 13. Depending on the ionic properties, excessive total dissolved solids can produce toxic effects on fish and fish eggs. Salmonids exposed to higher than average levels of CaSO4 at various life stages experienced reduced survival and reproduction rates 37. When total dissolved solids ranged above 2200-3600 mg/L, salmonids, perch and pike all showed reduced hatching and egg survival rates 37. 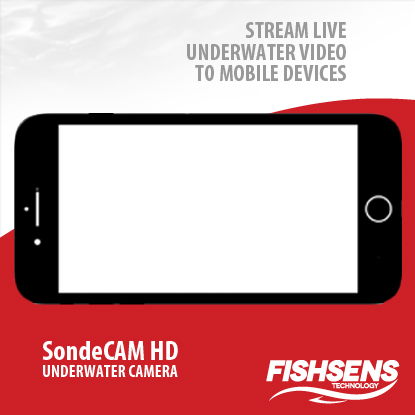 Dissolved solids are also important to aquatic life by keeping cell density balanced 11. In distilled or deionized water, water will flow into an organism’s cells, causing them to swell 11. In water with a very high TDS concentration, cells will shrink. These changes can affect an organism’s ability to move in a water column, causing it to float or sink beyond its normal range 11. TDS can also affect water taste, and often indicates a high alkalinity or hardness 12. Total dissolved solids are reported in mg/L. TDS can be measured by gravimetry (with an evaporation dish) or calculated by multiplying a conductivity value by an empirical factor 13. 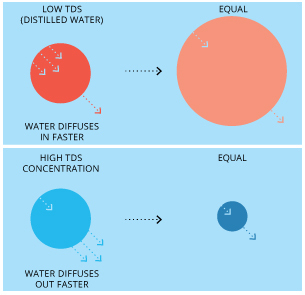 While TDS determination by evaporation is more time-consuming, it is useful when the composition of a water source is not known. Deriving TDS from conductivity is quicker and suited for both field measurements and continuous monitoring 42. When calculating total dissolved solids from a conductivity measurement, a TDS factor is used. This TDS constant is dependent on the type of solids dissolved in water, and can be changed depending on the water source. Most conductivity meters and other measurement options will use a common, approximated constant around 0.65 32. However, when measuring mixed water or saline water (with a conductivity value greater than 5000 uS/cm), the TDS constant should be higher: around 0.735 and 0.8 respectively 20. Likewise, fresh or nearly pure water should have a lower TDS constant closer to 0.47-0.50 36. Standard Methods for the Examination of Water and Wastewater accepts a TDS constant of 0.55-0.7, though if the water source is known to be high in calcium or sulfate ions, a constant of 0.8 may be used 13. Several conductivity meters will accept a constant outside of this range, but it is recommended to reanalyze the sample by evaporation to confirm this ratio 13. As seen in the table below, solutions with the same conductivity value, but different ionic constitutions (KCl vs NaCl vs 442) will have different total dissolved solid concentrations. This is due to the difference in molecular weight 40. In addition, the ionic composition will change the recommended TDS constant. At the same conductivity value, each solution will have a different concentration of dissolved solids and thus a different TDS factor. All three standards are acceptable for conductivity calibrations. However, the ionic composition should be considered if calculating total dissolved solids. 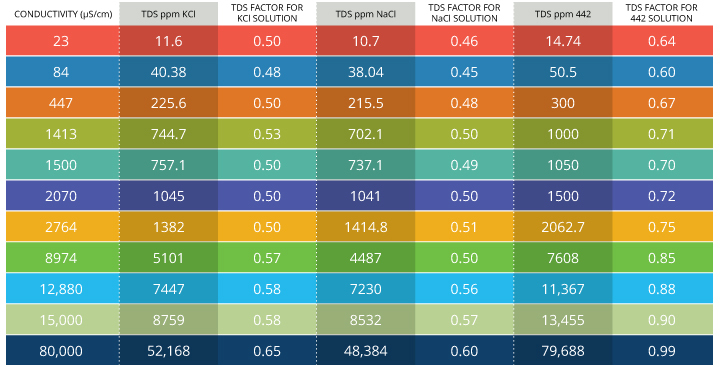 If a project allows for it, the TDS constant should be determined for each specific site based on known ionic constituents in the water 6. Factors that affect water volume (like heavy rain or evaporation) affect conductivity. Runoff or flooding over soils that are high in salts or minerals can cause a spike in conductivity despite the increase in water flow. Conductivity, in particular specific conductance, is one of the most useful and commonly measured water quality parameters 3. In addition to being the basis of most salinity and total dissolved solids calculations, conductivity is an early indicator of change in a water system. Most bodies of water maintain a fairly constant conductivity that can be used as a baseline of comparison to future measurements 1. Significant change, whether it is due to natural flooding, evaporation or man-made pollution can be very detrimental to water quality. Seawater cannot hold as much dissolved oxygen as freshwater due to its high salinity. Conductivity and salinity have a strong correlation 3. As conductivity is easier to measure, it is used in algorithms estimating salinity and TDS, both of which affect water quality and aquatic life. Salinity is important in particular as it affects dissolved oxygen solubility 3. The higher the salinity level, the lower the dissolved oxygen concentration. Oxygen is about 20% less soluble in seawater than in freshwater at the same temperature 3. This means that, on average, seawater has a lower dissolved oxygen concentration than freshwater sources. The effect of salinity on the solubility of dissolved gases is due to Henry’s Law; the constant used will changes based on salt ion concentrations 39. Euryhaline species have the widest salinity tolerance range as they travel between both saltwater and freshwater. Most aquatic organisms can only tolerate a specific salinity range 14. The physiological adaption of each species is determined by the salinity of its surrounding environment. Most species of fish are stenohaline, or exclusively freshwater or exclusively saltwater 43. However, there are a few organisms that can adapt to a range of salinities. These euryhaline organisms can be anadromous, catadromous or true euryhaline. Anadromous organisms live in saltwater but spawn in freshwater. Catadromous species are the opposite – they live in freshwater and migrate to saltwater to spawn 43. True euryhaline species can be found in saltwater or freshwater at any point in their life cycle 43. Estuarine organisms are true euryhaline. Euryhaline species live in or travel through estuaries, where saline zonation is evident. Salinity levels in an estuary can vary from freshwater to seawater over a short distance 21. While euryhaline species can comfortably travel across these zones, stenohaline organisms cannot and will only be found at one end of the estuary or the other. Species such as sea stars and sea cucumbers cannot tolerate low salinity levels, and while coastal, will not be found within many estuaries 21. Some aquatic organisms can even be sensitive to the ionic composition of the water. An influx of a specific salt can negatively affect a species, regardless of whether the salinity levels remain within an acceptable range 14. Salinity tolerances depend on the osmotic processes within an organism. Fish and other aquatic life that live in fresh water (low-conductivity) are hyperosmotic 15. Hyperosmotic defines a cell’s ability to eliminate water and retain ions. Thus these organisms maintain higher internal ionic concentrations than the surrounding water 16. On the other side of the spectrum, saltwater (high-conductivity) organisms are hypoosmotic and maintain a lower internal ionic concentration than seawater. Euryhaline organisms are able to adapt their bodies to the changing salt levels. Each group of organisms has adapted to the ionic concentrations of their respective environments, and will absorb or excrete salts as needed 16. Altering the conductivity of the environment by increasing or decreasing salt levels will negatively affect the metabolic abilities of the organisms. Even altering the type of ion (such as potassium for sodium) can be detrimental to aquatic life if their biological processes cannot deal with the different ion 14. 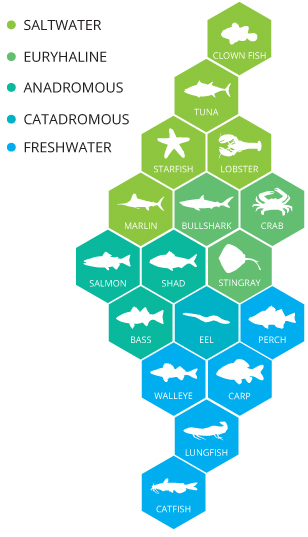 Most aquatic organisms prefer either freshwater or saltwater. 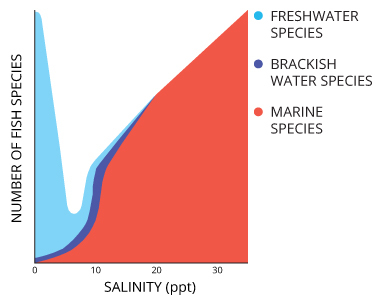 Few species traverse between salinity gradients, and fewer still tolerate daily salinity fluctuations. A sudden increase or decrease in conductivity in a body of water can indicate pollution. Agricultural runoff or a sewage leak will increase conductivity due to the additional chloride, phosphate and nitrate ions 1. An oil spill or addition of other organic compounds would decrease conductivity as these elements do not break down into ions 34. In both cases, the additional dissolved solids will have a negative impact on water quality. Salinity’s affect on water density is one of the driving forces behind ocean convection. Salinity affects water density. The higher the dissolved salt concentration, the higher the density of water 4. The increase in density with salt levels is one of the driving forces behind ocean circulation 22. When sea ice forms near the polar regions, it does not include the salt ions. Instead, the water molecules freeze, forcing the salt into pockets of briny water 22. This brine eventually drains out of the ice, leaving behind an air pocket and increasing the salinity of the water surrounding the ice. As this saline water is denser than the surrounding water, it sinks, creating a convection pattern that can influence ocean circulation for hundreds of kilometers 22. Conductivity and salinity vary greatly between different bodies of water. Most freshwater streams and lakes have low salinity and conductivity values. The oceans have a high conductivity and salinity due to the high number of the dissolved salts present. Many different sources can contribute to the total dissolved solids level in water. In streams and rivers, normal conductivity levels come from the surrounding geology 1. Clay soils will contribute to conductivity, while granite bedrock will not 1. The minerals in clay will ionize as they dissolve, while granite remains inert. Likewise, groundwater inflows will contribute to the conductivity of the stream or river depending on the geology that the groundwater flows through. Groundwater that is heavily ionized from dissolved minerals will increase the conductivity of the water into which it flows. Most of the salt in the ocean comes from runoff, sediment and tectonic activity 17. Rain contains carbonic acid, which can contribute to rock erosion. As rain flows over rocks and soil, the minerals and salts are broken down into ions and are carried along, eventually reaching the ocean 17. Hydrothermal vents along the bottom of the ocean also contribute dissolved minerals 17. As hot water seeps out of the vents, it releases minerals with it. Submarine volcanoes can spew dissolved minerals and carbon dioxide into the ocean 17. The dissolved carbon dioxide can become carbonic acid which can erode rocks on the surrounding seafloor and add to the salinity. As water evaporates off the surface of the ocean, the salts from these sources are left behind to accumulate over millions of years 27. Discharges such as pollution can also contribute to salinity and TDS, as wastewater effluent increases salt ions and an oil spill increases total dissolved solids 1. Conductivity is dependent on water temperature and salinity/TDS 38. Water flow and water level changes can also contribute to conductivity through their impact on salinity. Water temperature can cause conductivity levels to fluctuate daily. In addition to its direct effect on conductivity, temperature also influences water density, which leads to stratification. Stratified water can have different conductivity values at different depths. Water flow, whether it is from a spring, groundwater, rain, confluence or other sources can affect the salinity and conductivity of water. Likewise, reductions in flow from dams or river diversions can also alter conductivity levels 29. Water level changes, such as tidal stages and evaporation will cause salinity and conductivity levels to fluctuate as well. When water temperature increases, so will conductivity 3. For every 1°C increase, conductivity values can increase 2-4% 3. 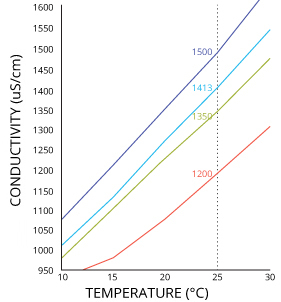 Temperature affects conductivity by increasing ionic mobility as well as the solubility of many salts and minerals 30. This can be seen in diurnal variations as a body of water warms up due to sunlight, (and conductivity increases) and then cools down at night (decreasing conductivity). Due to temperature’s direct effect, conductivity is measured at or corrected to a standardized temperature (usually 25°C) for comparability. This standardized reporting method is called specific conductance 1. Seasonal variations in conductivity, while affected by average temperatures, are also affected by waterflow. In some rivers, as spring often has the highest flow volume, conductivity can be lower at that time than in the winter despite the differences in temperature 23. In water with little to no inflow, seasonal averages are more dependent on temperature and evaporation. The effect of water flow on conductivity and salinity values is fairly basic. If the inflow is a freshwater source, it will decrease salinity and conductivity values 29. Freshwater sources include springs, snowmelt, clear, clean streams and fresh groundwater 21. On the other side of the spectrum, highly mineralized groundwater inflows will increase conductivity and salinity 1. 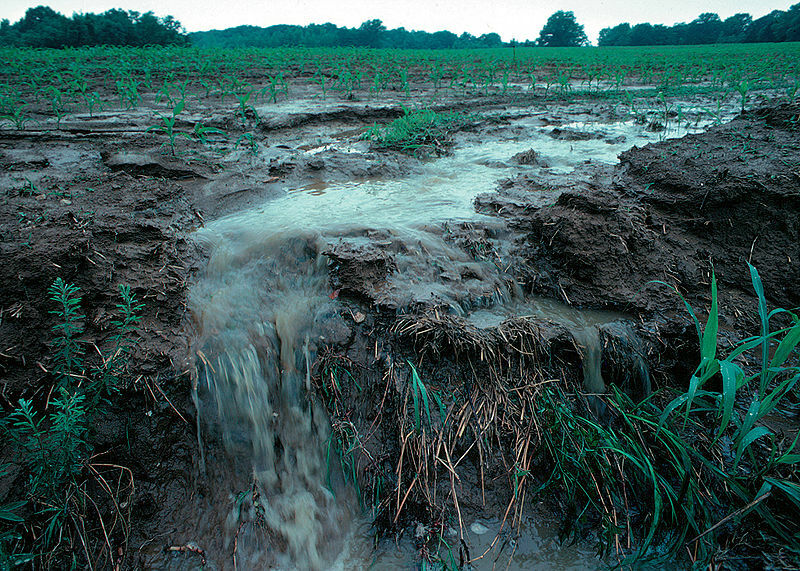 Agricultural runoff, in addition to being high in nutrients, often has a higher concentration of dissolved solids that can influence conductivity 23. For both freshwater and mineralized water, the higher the flow volume, the more it will affect salinity and conductivity 29. Rain itself can have a higher conductivity than pure water due to the incorporation of gases and dust particles 23. However, heavy rainfall can decrease the conductivity of a body of water as it dilutes the current salinity concentration 29. Flooding can increase conductivity when it washes salts and minerals from the soil into a water source. If heavy rainfall or another major weather event contributes to flooding, the effect on conductivity depends on the water body and surrounding soil. In areas with dry and wet seasons, conductivity usually drops overall during the wet season due to the dilution of the water source 44. Though the overall conductivity is lower for the season, there are often conductivity spikes as water initially enters a floodplain. If a floodplain contains nutrient-rich or mineralized soil, previously dry salt ions can enter solution as it is flooded, raising the conductivity of water 44. If coastal water floods, the opposite effect can occur. Though turbidity will increase, the conductivity of water often decreases during a coastal flood 45. Seawater will pick up suspended solids and nutrients from the soil, but can also deposit its salts on land, decreasing the conductivity of the water 45. Dams and river diversions affect conductivity by reducing the natural volume of water flow to an area. When this flow is diverted, the effect of additional freshwater (lowering conductivity) is minimized 23. Areas downstream of a dam or a river diversion will have an altered conductivity value due to the lessened inflow 23. As water flow fluctuates in an estuary, so will salinity levels. The conductivity of water due to water level fluctuations is often directly connected to water flow. Conductivity and salinity fluctuations due to water level changes are most noticeable in estuaries. As tides rise, saltwater from the ocean is pushed into an estuary, raising salinity and conductivity values 29. When the tide falls, the saltwater is pulled back toward the ocean, lowering conductivity and salinity 29. Evaporation can cause salinity concentrations to rise. As the water level lowers, the ions present become concentrated, contributing to higher conductivity levels 34. This is why conductivity and salinity values often increase in summer due to lower flow volume and evaporation 21. On the other side of the scale, rain can increase water volume and level, lowering conductivity 29. Temperature and salinity levels alter water density, and thus contribute to water column stratification 21. Just as a decrease in temperature increases water density, an increase in salinity will produce the same result. 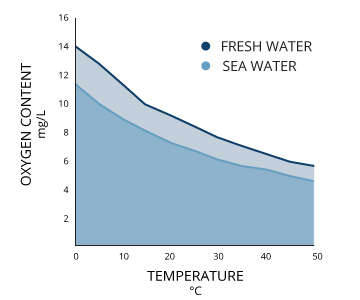 In fact, the change in water density due to a salinity increase of 1 PSU is equivalent to the density change due to a 4°C decrease in temperature 28. Vertical stratification due to salinity. Deeper water has a greater density and higher salinity than the surface water. Stratification can be vertical through the water column (seen in lakes and oceans), or horizontal, as seen in some estuaries 8. These strata are separated by an boundary known as a halocline 9. The halocline divides layers of water with different salinity levels 9. When salinity levels differ by a great amount (often due to a particularly fresh or saline inflow), a halocline develops 28. 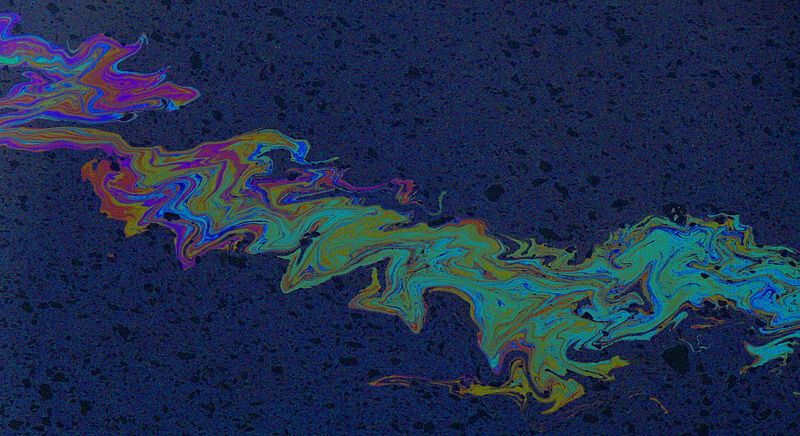 A halocline often coincides with a thermocline (temperature boundary) and a pycnocline (density boundary) (28. These clines mark the depth at which water properties (such as salinity, temperature and density) undergo a sharp change. Estuaries are unique in that they can have horizontal or vertical haloclines. Vertical haloclines are present when salinity levels decrease as the water moves into the estuary from the open ocean 8. Vertical haloclines often occur when tides are strong enough to mix the water column vertically for a uniform salinity, but levels differ between the freshwater and oceanic sides of the estuary 8. 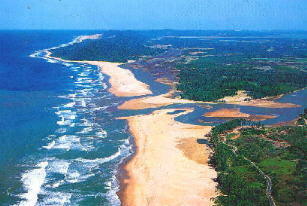 Estuaries can stratify horizontally between a freshwater source and the saline ocean. Horizontal stratification is present in estuaries where tides are weak. The incoming freshwater from rivers can then float over the denser seawater and little mixing occurs 23. Horizontal stratification also exists in the open ocean due to salinity and temperature gradients. 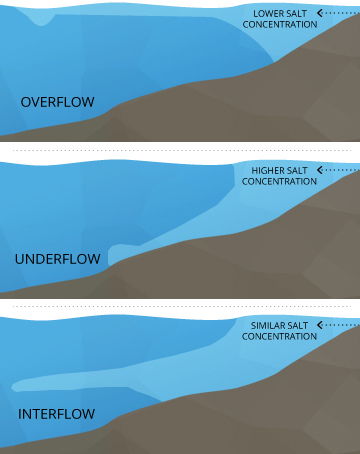 The salinity of an inflow can contribute to stratification. Freshwater flowing into saltwater will float, while saltwater flowing into freshwater will sink. 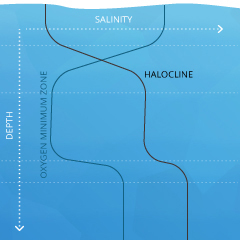 As saline water cannot hold as much dissolved oxygen as freshwater, stratification due to haloclines can contribute to hypoxic and anoxic conditions at the bottom of a body of water 21. While freshwater sources have a low conductivity and seawater has a high conductivity, there is no set standard for the conductivity of water. Instead, some organizations and regions have set limits on total dissolved solids for bodies of water 14,37. This is because conductivity and salinity can differ not only between oceans and freshwater, but even between neighboring streams. If the surrounding geology is different enough, or if one source has a separate inflow, conductivity values of neighboring water bodies will not be the same. Freshwater has a wide conductivity range due to geology effects. Freshwater that runs through granite bedrock will have a very low conductivity value 34. Clay and limestone soils can contribute to higher conductivity values in freshwater 34. Some saline lakes exist due to a restricted outflow 4. The conductivity of these lakes is dependent on the specific ionic composition present 4. The conductivity of estuaries tends to be the most variable as they are constantly influenced by freshwater and saltwater flows. The conductivity of seawater is dependent on the salinity and temperature of the water 38. Measurements will vary between the Equator and the poles as well as with depth due to conductivity’s dependence on temperature 38. As with conductivity, the expected salinity of a body of water can only be estimated. 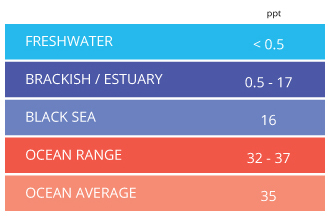 Ocean salinity values can vary between 30 and 37 PSU 22. Despite the differences in salinity, the ionic composition of seawater remains remarkably constant across the globe 3. The surface salinity of the ocean is dependent on rainfall. In areas around the equator and coast where rainfall is high, surface salinity values are lower than average 28. These different salinity values contribute to ocean circulation and global climate cycles 31. Once a history of conductivity measurements has been conducted, it is easy to see an established range for a particular body of water 1. This range can be used as a baseline to evaluate measurements as expected (and unexpected) values 1. It is important to point out that just because deionized water or ultra-pure water has no extraneous ions, that does not mean that it has a conductivity of 0 uS/cm 45. The conductivity value will be very small, and in most situations, negligible, but even deionized water has H+ and OH- ions present. At room temperature, the concentration of both H+ ions and OH- ions is 10⁻⁷ M (think pH – deionized water will have a neutral pH of 7 without atmospheric contact) creating a very small conductivity value 46. Despite this low conductivity value, deionized water will still have a salinity of zero; there are no salt ions present, only H+ and OH-, which naturally exist in pure water. As long as it has not had any contact with air (particularly CO2), deionized water should have a conductivity of 0.055 uS/cm, or a resistivity of 18 megohms at 25 °C 5,47. If the deionized water has equilibrated with air, the conductivity will be closer to 1 uS/cm (1 megohm) at 25 °C (and it will have a pH of 5.56). Most standards allow for a conductivity range of 0.5-3 uS/cm at 25 °C for distilled water, depending on the length of time it has been exposed to air 13,14. Temperature changes will have a greater effect on the conductivity of deionized water (or any nearly pure water), due to the molar equivalent conductivity of H+ and OH- in the absence of other ions 3. Instead of increasing conductivity by 2-3% per degree Celsius, it may increase by approximately 5% per degree Celsius 3. Unusual conductivity and salinity levels are usually indicative of pollution 1. In some cases, such as excessive rainfall or drought, they can be connected to extreme natural causes. Regardless of whether the result was caused by manmade or natural sources, changes in conductivity, salinity and TDS can have an impact on aquatic life and water quality. Most aquatic species have adapted to specific salinity levels 4. Salinity values outside of a normal range can result in fish kills due to changes in dissolved oxygen concentrations, osmosis regulation and TDS toxicity 4,21,37. When conductivity and salinity values extend too far from their usual range, it can be detrimental to the aquatic life residing in a body of water. This is why fewer, but perhaps hardier, species have adapted to life in estuaries, where salinity is constantly in flux. Estuarine life can tolerate rapidly changing salinity levels better than both their freshwater and marine counterparts 4. But even these brackish-water species can suffer if the salinity changes become too extreme. Fondriest Environmental, Inc. “Conductivity, Salinity and Total Dissolved Solids.” Fundamentals of Environmental Measurements. 3 Mar 2014. Web. 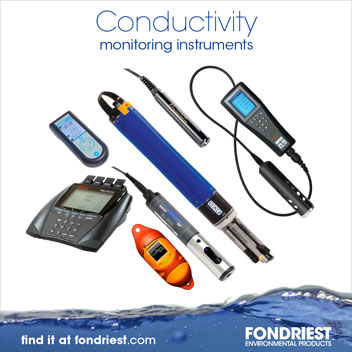 < https://www.fondriest.com/environmental-measurements/parameters/water-quality/conductivity-salinity-tds/ >.